22 Dental Plan is a membership plan that allows you to pay a regular monthly amount so you can spread the cost of your routine oral examinations and hygiene appointments. Being a member of our Plan allows us to take better care of your oral health as we will see you at regular intervals at no extra cost. Therefore we are able to identify any issues sooner rather than later. We can help you at reception to fill in the necessary paperwork, or you can do it over the phone by calling the reception desk. You can also register online yourself see below. 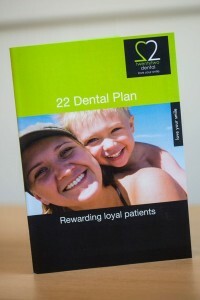 Take a look at a copy of our 22 Dental Patient leaflet. Click to see a copy of the supplementary insurance. Click here to register with the practice onto our 22 Dental Plan.